The focal point of this historic site is the Birthplace. 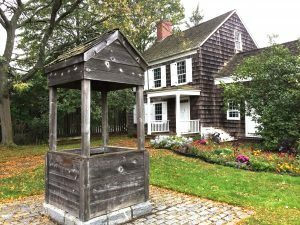 Built circa 1816 by Walt Whitman’s father, the house was constructed with hand-hewn beams held together with wooden pegs. The home is two floors with an attic. Its unique features, such as the corbeled chimney and storage closets in the fireplace walls, add to this home’s extraordinary character. 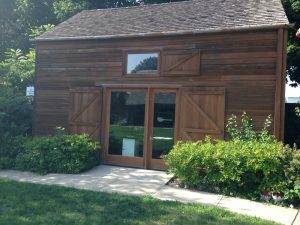 In 1957, the Birthplace was deemed a New York State Historic Site. In 2001, the home was restored to its original state with its original floorboards on the second floor. Guests are welcomed by lilac bushes where photographs indicate they once grew and were referred to by Walt, himself. 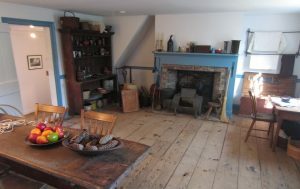 The home houses 350 artifacts typical of a 19th century Long Island family in 1821, specifically at the time of the birth of Walt’s younger sister Mary Elizabeth. Tour guides take guests throughout the home on informative tours that allow visitors to take a step back in time and imagine what life was like while Walt lived there. 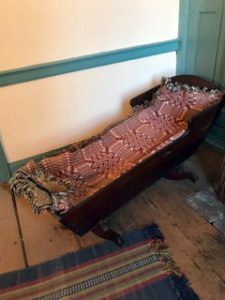 Cradle in the Birthplace similar to one that would have been used by Walt’s sister Mary Elizabeth. 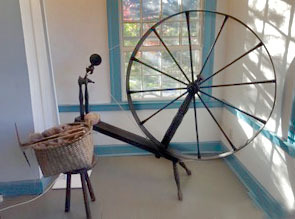 Spinning wheel from the Birthplace. Kitchen of the Birthplace as it would have looked in 1821. 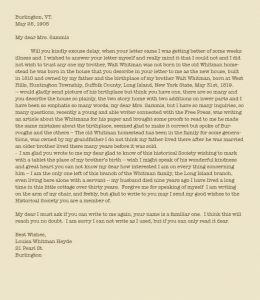 Letter from Louisa Whitman Heyde to Mrs. Sammis: This letter written by Walt’s sister provides historical documentation that Walt was born here at this location.